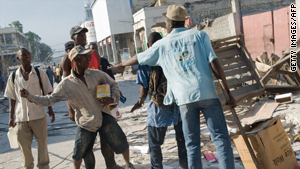 Looters brawl as a man tries to intervene in downtown Port-au-Prince on Monday. (CNN) -- With the people of Haiti hungry, desperate and frustrated nearly a week after a powerful earthquake, sporadic violence and looting are erupting in the badly damaged capital. CNN's Anderson Cooper witnessed a group of young men breaking into a supply store in the city's commercial district and taking away boxes of candles Monday afternoon. They were followed by several hundred others, including women who used sacks to carry away items. Two Haitian police officers and the store owner tried to barricade the property. Police fired shots into the air to try to disperse the crowd, according to Cooper. Fights broke out among looters. Cooper saw one man beaten until one of his arms bled. A boy collapsed onto the street in a pool of blood, Cooper said, describing the situation as "a frenzy of looting." Reports of looting have escalated in the days since Tuesday's 7.0-magnitude earthquake leveled Port-au-Prince, leaving the capital in chaos as emergency aid workers and authorities scramble to help. "People are actually stealing this, then will sell it later, and then they'll use that money for their families," Cooper reported. Secretary-General Ban Ki-moon said he wanted to increase the U.N. peacekeeping force in Haiti with 1,500 additional police and 2,000 peacekepping troops to better respond to the quake's aftermath. Ban says he has submitted his request to the U.N. Security Council. The U.S. military considers the security situation "stable," Rear Adm. Mike Rogers, director of intelligence for the Joint Chiefs of Staff, told reporters Monday. Rogers said that means meant the United States can carry out operations -- including search and rescue, distribution of aid, moving people in and out of the capital and flying aircraft. Nothing suggests "widespread disorder" and panic, Rogers said, citing the well-publicized incidents of unrest as "isolated events." No official death toll has been declared, but estimates range from 100,000 to 150,000 in Port-au-Prince alone. The buildings have crumbled to rubble, leaving hundreds of thousands of homeless survivors roaming the streets. About 3 million people -- one-third of Haiti's population -- were affected by the quake, the Red Cross said. About 10 million people most likely felt the shaking, the U.S. Geological Survey said. All of this has occurred in the poorest country in the Western Hemisphere, where infrastructure is weak and many people were already living in poverty. In several sections of Port-au-Prince, people could be seen scavenging in the streets, pushing each other away to pick up whatever they could find in the collapsed homes. They rummaged through plastic bags lying amid mountains of debris. Other survivors clutched tightly to their finds as they walked through the streets. For business owners, the growing violence is troubling because there are fewer police officers on duty after the earthquake. Many officers are injured or dead. The police who are on duty are armed with automatic weapons, and they have fired shots in the air to scare off looters. Even before the earthquake, robberies and home invasions organized by gangs were frequent in Haiti, according to the U.S. Department of State's Overseas Security Advisory Council. Adding to Haiti's frustration is the difficulty in transporting critical aid and supplies to survivors. Shortly after the earthquake, international aid groups responded quickly, trying to get food and medical supplies into Haiti to prevent the situation from going from "dire to absolutely catastrophic." "I think people need to understand that out in Port-au-Prince, it looks ... like Tokyo probably did after World War II. It's flat. It looks like atomic bomb went off. The streets are completely blocked," said Kenneth Merten, the U.S. ambassador to Haiti. He added, "There are rescue efforts going on. It's just difficult to physically get there."